Living in a National Park is such a luxury. We’re surrounded by vast open spaces and long trails to disappear down. It’s so wonderful to see people smiling from their dose of fresh air, mountains, rivers, and big trees. But it’s the state parks, the ones that are a little closer to urban centers, that people living in the cities can escape to for shorter periods: before or after work, or between other errands and chores on the weekends. Over on Two-Heel Drive, Tom Mangan has summarized a list of Bay Area State Parks that are under threat. (Ano Nuevo? Mount Diablo State Park? Angel Island? Really?!?). You can find a more complete listing of which parks will remain open, and those which are being “moved to caretaker status” which means that they will still be protected, Government-owned land, but will not be open to the public. Visit the California State Park Foundation to find out what you can do about it. I’ve been thinking about backpacking lately. A lot. And I’ve been spending inordinate amounts of money on it too – or preparing to spend inordinate amounts of money anyway. As it turns out, it has been a embarrassingly long time since I’ve gone backpacking, and I’ve just realized how much I miss it. It isn’t that we haven’t been getting out at all. Last summer we were pretty excited about getting into some longer runs, and we started getting a little more serious about collecting pictures, but as activities that take only part of a day, we were getting pretty comfortable returning home to the miracle of modern appliances, hot showers and a comfortable bed. No longer. I’ve never taken a picture, but it’s always disconcerting when there are enough butterfly carcasses in and by the side of the road that they are easy to see at driving speeds. They are everywhere, fluttering, broken and dying. Please slow down, enjoy the butterflies and the scenery. It’s a small price to pay for saving hundreds of these relatively uncommon butterflies. (now through June), please slow down and enjoy this spectacle. In most years California Tortoise Shells are a relative uncommon species. butterfly. The larvae of the species feed mostly on ceanothus shrubs. tannins later in the season, making them more nutritious for larvae. (N.
Plans to set our house in Yo West up to be a revenue-generating vacation home rental are moving ahead. We passed the planning inspection last week, and today passed building inspection, which I think was the last hurdle to get the permit from the county. Now, there are only the remaining insurance and logistics hurdles, and we’ll be ready. Not that those are small hurdles. In order to rent out your home on a nightly basis, there are certain steps required by the County to make sure that your home is fit for rental. First, there is the permit fee. Then, you need to make sure that your property has safety precautions in place. They want to make sure that your fire extinguisher is located in a place where a visitor would easily be able to find it. A homeowner can keep their extinguisher under the kitchen sink, but a vacation rental needs to have it mounted in plain sight between 3-5 feet off the ground, for example. There are fire-escape signs to be made (silly given our ultra-simple floor plan – but required) as well as notices about neighborhood rules, quiet hours and things like that. I’ve made a call to our Insurance agent as well, and hopefully she will be able to get back to me with some numbers tomorrow or early next week. I wonder how much extra we will pay in insurance in order to rent. At least there is no wood-fire in the upstairs to tempt our renters to burn our house down. I know a lot of people are looking to build a fire when they come up to Yosemite, Tom loves the ambiance of the flames and the radiant heat, and a heat source in the winter is always good for me, but we’ve heard horror stories of people who don’t know the first thing about building fires and it’s a little frightening to think of setting them loose in your house, unsupervised. People who have chopped wood on the living room floor with a hatchet and left gouges in the flooring. People who consider starting their fireplace fires with white gas or gasoline. I know that it’s rare, but it’s still a bit unnerving. Nevermind what happens with wood-burning stoves. With the insurance estimates coming along, now we are looking at trying to figure out what to do with the very special artwork now hanging from our walls. Each piece has a unique and personal story, and we aren’t sure if we would trust them to strangers. My piano. The TV situation – we have an old TV inherited from my grandfather that is nearing the end of its useful life. The screen flickers when you tap the ground in front of it, until it has warmed up for a while. We have a modest, but decent collection of DVDs. Will they get taken? What to do with our books and other personal possessions while other people are in our house? Perhaps we can put all those things in our room and only rent out the guest bedroom? There is still lots of work and decisions moving forward. 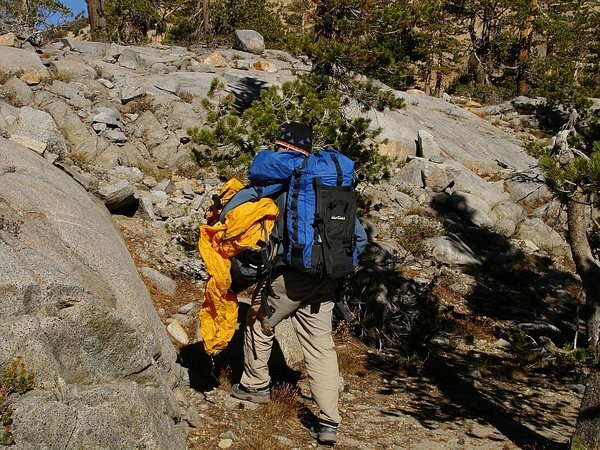 Still, with luck, we will be able to take advantage of this summer season and off-set some of the expenditures of finishing out the ground-floor unit… and … um … setting ourselves up with new backpacking gear. But, I guess that is another post. The full moon is coming this Saturday, May 9, and full moons are always a special event in Yosemite, but in spring time, you also add the magic of the moonbows in Yosemite Falls. Walking through the Valley under a full moon is a sublime and otherworldly experience. The silvery light bounces off the granite walls and filters through the trees. Just that is worth staying up late and venturing out into the not so warm nights. But when the angles are all just right, and there is enough water in Yosemite Falls, moonbows appear. 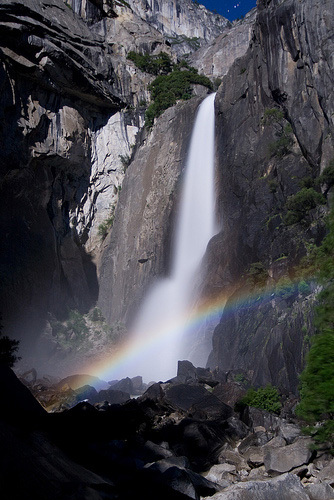 A group from Texas State University has done the calculations to predict when the Yosemite Falls moonbows will be seen. This year, it seems like they have added another viewing location to their predictions. In addition to the viewing area next to the bridge at the base of Lower Yosemite Fall, they recommend times to visit the Sentinel Bridge parking area to view moonbows in Upper Yosemite Fall as well. The moonbows usually appear to the naked eye as arcs of silvery light, but with the right technique, photographers can capture all the colors of the rainbow in that arc. It’s a challenging shot – to capture the ambiance of the moonlight, and the last time I went I knew that I didn’t have the right equipment or the expertise to even try, so I stood in awe and just watched. Magic is magic. You don’t HAVE to be looking through a camera lens to appreciate that. Plus, there is a meteor shower coming up that peaks tomorrow morning (May 6). The Aquarid Meteor Shower comes from the tail of Halley’s comet, and seems to emanate from the constellation of Aquarius. The display is most prominent in the Southern Hemisphere, but even those of us up north can enjoy it when Aquarius peeks above the horizon around 2-2:30 am. For extra incentive, the shooting stars that we do see will likely be Earthgrazers – long slow spectacular streaks of light from meteorites that skim across the upper atmosphere.